Concerned residents in Great Bowden are raising fears over a possible new plan for houses in their village at a site coveted by developers several times over the past 40 years. Green fields near Berry Close in the village look set for an imminent planning application after engineers from a housing developer were spotted at the site last week carrying out land surveys. Villagers are fearing the worst and have already been in touch with ward district councillors Phil Knowles and Sarah Hill to raise eyebrows over any new housing proposal. It would be the third time since 1987 that a developer has attempted to secure planning permission there for sites of more than 35 homes. Embattled residents fought fiercely in 2010 and 2011 to fight plans for a 56-house proposal from The Matthews Trust on land at Buckswell Field, near Berry Close. 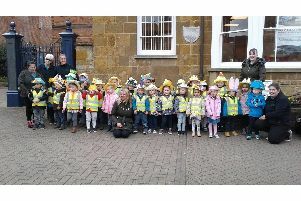 After a long protest campaign, Harborough District Council refused the plan in November 2010 and the Planning Inspectorate upheld the council’s decision in February 2011 after the applicant appealed. Particular concerns raised at the time revolved around traffic congestion, the loss of greenfield land and the fact it was in a conservation area. Hundreds turned out for public meetings over the plan. Cllr Knowles and Cllr Hill told the Mail this week: “From what we have been told, ecology or archaeological work is being undertaken at Berry Close to support a potential future planning application. “We appreciate each application must be looked at on its merits but, if true, this is deeply concerning. Developers submitted blueprints for 40 homes at Berry Close in 2002, and for 37 homes in 1987. Smaller scale plans came in 1990 and 1996. All were refused or withdrawn. Earlier this month residents in neighbouring Little Bowden heard about new housing plans for their village. Campaign group Protect Little Bowden has been formed to combat plans for 60 houses at Dunmore Road.